I likely belabor the obvious when writing this, but I am far from competent in the land of technology. If it weren't for the fact that Blogger makes blog creation almost painfully easy -- even I have created a few -- this and some other small points in the Blogosphere would not exist. That written, I learned how to create small videos and then, the past day, learned how to upload them to YouTube. Surely that is a remarkably easy feat for yourself but a massive step ahead for the CCBIs (Computer-Challenged Blithering Idiots) like myself. I am not new to shooting video; I've had a Sony DCR-VX2000 since 2002 and possess many hours of trackside video in MiniDV. That camera has taught me much about tilting, panning, framing, white balance, and possession of a proper tripod with fluid head. Now, with all that footage, I need an editing system and a computer with the horsepower to pull it off. The breakthrough for me came with my purchase of the Flip Slide. This is an HD-compatible videocam about the size of an elongated pack of cigarettes. Its convenience is also its greatest drawback. In my sixth decade of life I don't "hold" quite like I used to when I was freelancing in my early 20s. It's damned tough for me to keep the Flip still, particularly when shooting where there is nothing on which I can lean. One final bit about the Flip Slide: I don't yet have an HD TV at home, so I played the various Flip videos on an HD unit at work; I was absolutely stunned by the resolution, clarity and color saturation. Unfortunately, it also emphasized the point that my videos resemble those of the guy that shot Cloverfield. The video was taken during the making of this post. I am standing next to UP 5652, a GE C44ACCTE locomotive, as its 4,390-hp engine idles. There is, I must admit, nothing like standing next to a four-stroke diesel locomotive engine, even as it idles. You can literally feel your lungs vibrate. Every few moments there is a throttle blip which helps to keep the engine clear. The first hiss you hear is the air tank (for the braking system) venting to keep from overpressurization. The second, shorter hiss is the air dryer venting. For those who may not know, air dryers are installed on all GE and EMD locomotives. Any time you compress air (required for a locomotive's braking system as well as those of the trailing train cars), you get condensation. Air dryers remove all condensation before air is introduced into any air lines on the locomotive or the brake pipes of an adjoining train. Absent completely dry air in the pipes, the lines, fittings and connectors would start to rust. Air dryers then vent this condensation, under pressure, to the outside atmosphere. When playing the video, turn up your speakers. If you can adjust bass, do so. You might then begin to approximate what it is that I heard during the recording. Enjoy. More videos to come. Please let me know your thoughts and opinions. There were, at one time, quite a number of locomotive builders in America, when both steam and diesel power was extant. American steam builders included Alco (American Locomotive Company), Baldwin, Lima and, to a small degree, HK/Porter and Brooks. Once steam declined, two major diesel-electric builders remained standing: GE (General Electric) and EMD (Electro Motive Division of GM, General Motors). EMD was the number one seller of diesel-electric locomotives until 1989, when GE then became the largest builder of locomotives in the United States. The reasons for this are sufficiently voluminous and detailed as to warrant an entirely separate post one day. EMD was purchased from GM in 2005 by the Greenbriar Equity Group LLC and Berkshire Partners LLC. They decided to retain the initials EMD -- for purposes of familiarity -- which now stood for Electro Motive Diesel. The purchase was for $820 million in cash, Caterpillar said, plus a “net working capital adjustment subject to post-closing finalization” that it estimates at about $108 million. In a deal Caterpillar first announced on June 1, it purchased EMD from private equity fund owners Berkshire Partners and Greenbriar Equity Group, which had bought it in 2005 from General Motors. Berkshire Partners is not related to Warren Buffett’s Berkshire Hathaway, which owns BNSF Railway. The company says EMD can also further boost Progress Rail, which is already a major supplier of rail and transit products and services including locomotive repairs and upgrades, railcar replacement and remanufacturing, track work, rail welding, signaling and maintenance of way equipment. EMD and GE Transportation supply North American freight railroads with their powerful line-haul locomotives along with a number of smaller-powered yard units. Neither has been selling many new locomotives on this continent in recent years after the freight recession led railroads to lay up hundreds of units from their fleets, but a major governmental push to inter-city passenger rail in the U.S. and overseas is offering new market opportunities for many rail equipment suppliers. 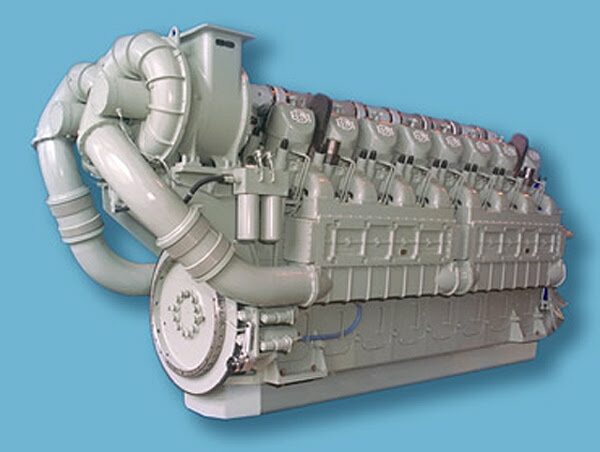 Though EMD hasn't built its SD90MAC-H in years and, in fact, most of the H-engined 6,300-hp units have been scrapped (more on this in a later post), it is rumored that Caterpillar wanted to acquire all the rights and blueprints to the base 265H-engine itself. It is interesting to note that Caterpillar did in fact provide prime movers for diesel-electric locomotives at one time, when the Morrison Knudson MK5000C locomotive was introduced in 1994. The MK5000C was powered by the 3612 V-12 Caterpillar block. Each cylinder of this engine displaced a massive 1,121 cubic inches. A total of six MK5000C locomotives were produced. They had 5,300-gallon tanks and a maximum geared speed of 70 mph. The Cat 3612 engines, however, had problems which resulted in Southern Pacific and Union Pacific returning their demonstrator locomotives back to MK. Issues were with the main bearings and with the Kato alternators. 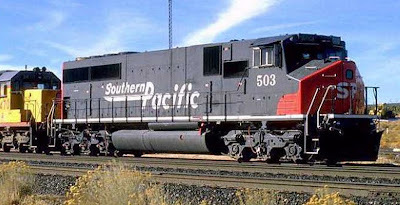 However, it is in direct response to the MK5000C locomotive that GE produced its AC6000CW and EMD responded with, first, the 20-cylinder SD80MAC at 5,000 hp and then the SD90MAC-H. The Utah Railway purchased all six units but ended up yanking the Kato alternators and Cat engines, replacing them with EMD alternators and prime movers. With the purchase of EMD, Caterpillar is deep into the locomotive game and may use EMD's diesel engine expertise to upgrade their own engine skills. It's time for EMD to become a strong and competent locomotive manufacturer once again.